Whether you were fortunate enough to snag a ticket in the two-minute window that they were available online, or you were one of the very brave who waited for hours in line at the Beachcomber for tickets, standing against the storm at Wolly Beach as it came in off the ocean right across the street, you were one of the lucky few. 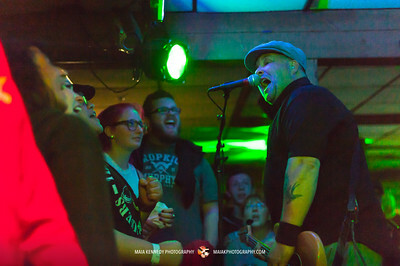 This was a very special show, put together at the last-minute by the Dropkick Murphys to say goodbye to the Beachcomber, a final show before the doors closed. Only 250 tickets were available! These have been uneasy times in the Boston-area music community: a lot of clubs and venues have been closing, first TT the Bears, soon Johnny D’s and now The Beachcomber. This Quincy music club was started 56 years ago by Jimmy McGettrick and has been a longtime local favorite hangout ever since, featuring such stars as Louis Armstrong and Loretta Lynn back in the day. The Beachcomber has also been a rite of passage for local bands on their way up and also a consistent source of live Irish music, like the Fenian Sons, who also played a farewell show there recently. Ken Casey, lead singer for the Dropkick Murphys and lifelong friend of the McGettrick family wanted to have a proper sendoff for the club and this one will certainly go down in history! The evening started off with an acoustic set by the Barroom Heroes, two brothers who have made quite a mark for themselves, playing more shows than most kids their age have even been to. They are close with the Dropkick Murphys and have opened for them many times before; they actually named their band after a Dropkick Murphys song. Then Ken started the Dropkick Murphys’ set with a moment of silence for Mr. McGettrick, who passed away a few years ago. This was then followed by a recording of Mr. McGettrick, announcing the band when they played there for a benefit show many years ago. After that, it was practically non-stop music for over 2 hours! This show was like no other. The Dropkick Murphys are not only a local band and loved by the locals, but they now are world-renowned and tour internationally. Their shows these days are usually at much larger venues, seating several thousand. But this show was more like a high-school party in your best friend’s basement! There were no barriers between the band and the audience; a lot of us were squeezed in standing just inches from the guys. For “Kiss Me I’m Sh*tfaced,” instead of inviting the girls onto the stage, since there wasn’t enough room, Kenny jumped right into the crowd and kept playing. Everyone knew the words and sang along to every song, many even being invited to join in on the microphone. I’m going out in style. spread my ashes all about. and dump the sucker out. and toast me for a while. Even when the band finally had to leave the stage, Kenny stuck around to say hi, take selfies, and autograph anything people brought to him. He is like the big brother you always wanted, the guy who can stop the heated bar arguments or beat up the bully that's been pestering you. All proceeds from this show went to the Gavin Foundation, to help in the fight against opiate addiction.